See Zhonka Broadband media page for more Internet business-related press. Interview from Business Examiner (.pdf) – Q & A newspaper interview discussing OlyWa / ATG merger, Internet marketing, etc. Not sure if you saw this but … a few month’s back, my colleague and co-conspirator at Zhonka! was at it again with a wise and insightful bit of commentary on the unnecessary hassle imposed on ISPs who some think should pay the role of snoop and fink. 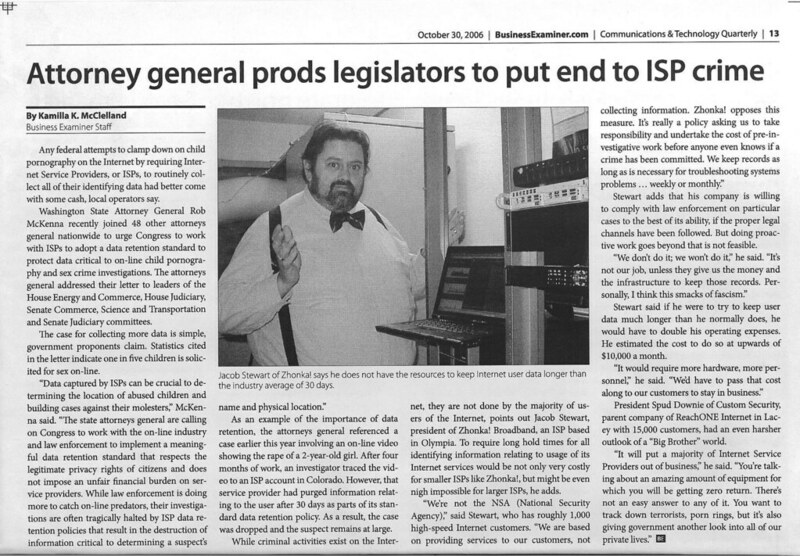 Jay’s commentary is below form his blog post Yet More Business Press from Tuesday, November 21, 2006. This is in response to the Attorneys General of many states, including Rob McKenna of Washington State, putting out a hot-air puffery press release (read the actual letter here) on how ISPs could help catch paedophiles, which is true, if we snooped on traffic and violated the privacy of our customers. Surely, there is a better way to protect children than turning our country into a “Big Brother” police state, where ISPs and telephone companies keep records of activity and data forever, so that the “authorities” can sift through it long after it would have protected any children. Law enforcement needs to start doing it’s job, and stop hassling poor (and brown) people. Anyway, I think these are some of my best quotes ever published in the print media, and am proud to been able to speak out against this kind of fishing expedition. Some people in the industry , however, see no problem with offering free wireless Internet access, believing that if a customer can pay for a mocha and owns a laptop, they can probably order a second drink, too. With an Internet line and a piece of hardware that processes the signal, cafes can be up and running in no time. The initial set-up cost is between $30 and $50, according to Olson. He believes pay-per-use Internet access turns customers off because they have to spend time entering their credit card information onto a home page and might have to make immediate decisions about the number of minutes or months they want to subscribe. Also, the fee to jump on the Internet might seem silly to some people when they have plunked down money for a mocha and pastry, and perhaps plugged a parking meter for the time they are in the cafe. “You’re already in there paying for premium beverage and a place to sit, ” says Olson. Free wireless access began popping up downtown about three years ago, when Dave Olson and Jacob Stewart launched Zhonka Broadband. They were looking to join with cafes to provide free Internet access. They started out by asking merchants they knew. The idea took off. The clientele changed at the 4th Ave. Tav, where people began coming in at the noon hour for lunch and free Wi-Fi, he said. Today, the laptop has become a fixture in coffee shops. Wi-Fi hot spots aren’t widely publicized — though Zhonka publishes a list online — but people have found a way to locate them. Banner said she looks for the distinctive “Zhonka” sticker in shop windows or looks for other laptop users. Word has spread through word of mouth for Caffe Vita, Fink said. Popular Science magazine ranked Seattle and Olympia as number one and two respectively for having the highest national percentage of Internet customers. The magazine credited the cities’ relatively high number of free wireless access points as a major reason for the high rankings. It also credited the two cities for bucking a national trend for wireless hotspots to charge users a fee for the service. Olympia-based Zhonka Broadband maintains several free wireless spots in the South Sound region. Company spokesman Dave Olson said it allows the company to showcase its high-speed DSL technology while businesses with the hotspots find that they help to attract customers. New guidelines for distributing and installing software in hopes of decreasing Spyware are specified in HB1021, signed into law on May 17th. Often delivered as e-mail attachments or installed along with free software, these malicious software programs are secretly installed on unprotected computers. Once installed, Spyware inundates the victim’s computer with pornographic pop-up ads and windows with bogus security warnings, without any means to remove or de-activate the ads. In other scenarios, “Malware” programs perform more nefarious activities such as installing a “Trojan” program, by which the intruder gains control of the infected computer. The compromised computer is then used as a “zombie” to deliver infected e-mail or propagating the Spyware through Trojan and Worms. Alternatively, the infected computers may host Phishing sites or even participate in denial of service attacks against other websites. HB1888, signed May 5th, prohibits sending e-mail soliciting personal information using fraudulent means such as misrepresentation. In a practice commonly called Phishing, a fraudster sends massive quantities of e-mail purporting to be from major bank, well-known websites, or credit card providers seeking account “clarifications” or “updates.” Unsuspecting users who respond to the invalid inquiries are taken to spoofed websites that may look identical to legitimate sites. Once they reveal sensitive information, they easily fall victim to identity theft and credit card fraud, often without knowledge how they’ve been duped. This cycle of junk-mail and computer compromise is a burden on Internet Service Providers (ISPs) who process the excess junk e-mail and experience increased customer support. Dave Olson, of Olympia’s Zhonka Broadband, points out, “In some cases, we need to contact customers who are unwittingly sending out junk mail from an infected computer – they are usually surprised and then frustrated about the clean up work.” Olson also says that Zhonka encourages a proactive approach to computer protection and maintains a list of prevention resources on the company’s website. Stewart is no novice to the Internet game. He started OlyWa.Net in 1995. That first company grew quickly and was netting some $1 million a year before merging with Advanced Telecom Group in 2000. After the OlyWa.Net merger, Stewart says he took a much needed break from the hectic day-to-day stress of building and running a tech company. “I needed time to decompress,” he says. That break didn’t last long. In the wake of the Internet boom, Stewart decided to build a leaner, more efficient business. With the help of a small team of investors, Stewart created Zhonka in 2003. Ron Main of Cable Communications Assoc., Dave Olson of Zhonka Broadband, and Jacob Stewart & Gary Gardner of WAISP join Gov. 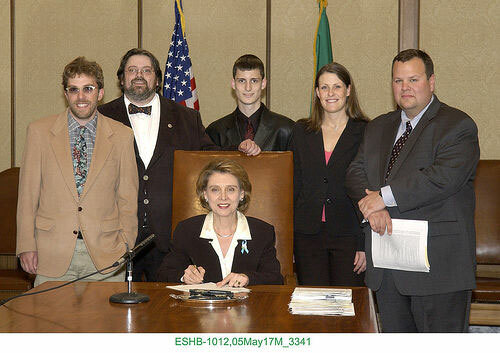 Locke for SB 6259 bill signing on March 26 2004. OLYMPIA – During the recent Legislative session, local Internet businesses and industry groups supported a bill to keep Internet services tax-free, in Washington at least. SB 6259 extends the moratorium on cities and towns imposing new taxes on Internet Service Providers (ISPs). A similar Federal bill (HB 49) passed in the U.S. House of Representatives last year. However the companion Senate bill (SB 150) failed, opening the door for municipalities to levy additional taxes on ISPs and their customers. In Washington, we already have. OLYMPIA – As part of Zhonka Broadband’s unique “Surfbreak” program, innovative businesses around the Puget Sound are serving up free wireless Internet access for customers. While other companies offer “wi-fi” (short for wireless fidelity) for a charge, Zhonka’s Surfbreaks are no-cost and hassle free with no login, password, or membership required. With diverse locations from grassy parks to late-night diners, there is a Surfbreak location to suit most anyone’s preference. Zhonka, an Olympia-based Internet service provider, introduced this unique program in early 2003 and interest quickly spurred expansion to numerous cafes, espresso shops, computer stores, taverns, and public markets throughout Western Washington. Recent additions include coffee roasters Batdorf & Bronsons’ Dancing Goats cafe, CafŽ Allegro’s two locations near the University of Washington, and the Olympia Farmer’s Market plus a few micro-brew taverns. A complete list – including contact information – is located online athttp://www.zhonka.net/surfbreak/. Locations are also identified with distinctive “Free Wi-fi for the People” posters and window stickers. The Surfbreak locations use high speed Zhonka DSL connections to power the wi-fi hot-spots. A customer simply brings a wireless ready laptop or PDA to a Surfbreak locations and “Voila!” they are online. When more than three dozen “movers and shakers” gather in one place, you can expect the kind of energy that lights up a room, especially when the group consists of ambitious, younger standouts in the world of local business. That was the case last week, when The Tacoma Club Young Executives and Business Examiner Newspaper Group hosted an event recognizing this inaugural class of 40 Under 40. The energizing power was awe-inspiring, even to older guests at the gathering, who came away with assured that the future of the South Sound is in quality hands. On the pages that follow, you will have the opportunity to meet this stellar crowd — presented here in alphabetical order — and get to know a little more about what is important to them. Remember that there is far more talent here than can be adequately described in words. When you see them at work, at service or at play in the community, take the initiative to meet them — you will be as impressed. And plan right now to make your own nominations for the 2004 40-Under-40 List when it comes round next spring. As a managing partner and marketing director of an Internet service provider, Dave Olson does a lot of document writing, including business plans, proposals, agreements, contracts, press releases, marketing collateral, letters, technical FAQs and media articles. He also oversees corporate governance and company financing issues under his title as Minister of Marketing Affairs. “Additionally, I organize and implement advertising campaigns, special events and promotions including the free community wireless access surfbreaks,’ customer appreciation parties and donated access,” he explains. “I aim to help grow Zhonka Broadband into an innovative and profitable ISP serving communities throughout the Northwest region,” Olson says. “I would also like to finish my elusive Evergreen degree and perhaps attend law school at UBC specializing in intellectual property, international trade and arbitration. One way or another, I hope to continue to travel internationally and perhaps make another documentary film or two,” he adds. Olson’s role models and heroes have always been writers, artists, activists and adventurers such as H.D. Thoreau, Edward Abbey, Gary Snyder, Walt Whitman, Edmund Hilary, Thor Heyerdahl, Leo Tolstoy, Vaclav Havel, Leo da Vinci, etc. As an entrepreneur in a high-tech small business, Zhonka Broadband co-founder and Technology Guru Jacob Stewart finds that he wears many different hats at different times as necessitated by circumstance. He feels the real gratification comes when the business starts to flourish after putting in so much time generating business plans and standards of practice, finding investors for funding, networking with the local business community and marketing our business directly to the community. “That is the most fulfilling part of my job,” Stewart says. 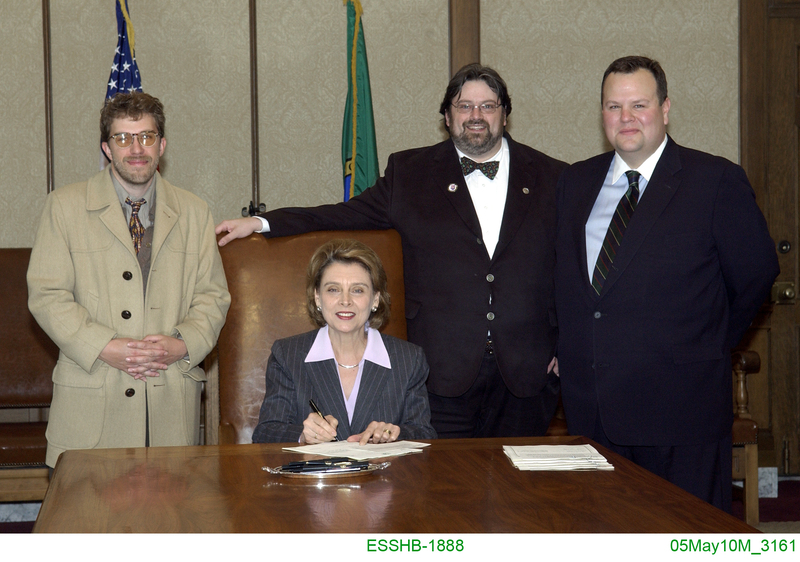 Stewart was also co-founder and Vice-president of Information Technology and chairman of the board for ISP, Oly.Wa.net and currently serves as vice-president of Washington Association of Internet Service Providers, which helped push through the state’s anti-SPAM bill. 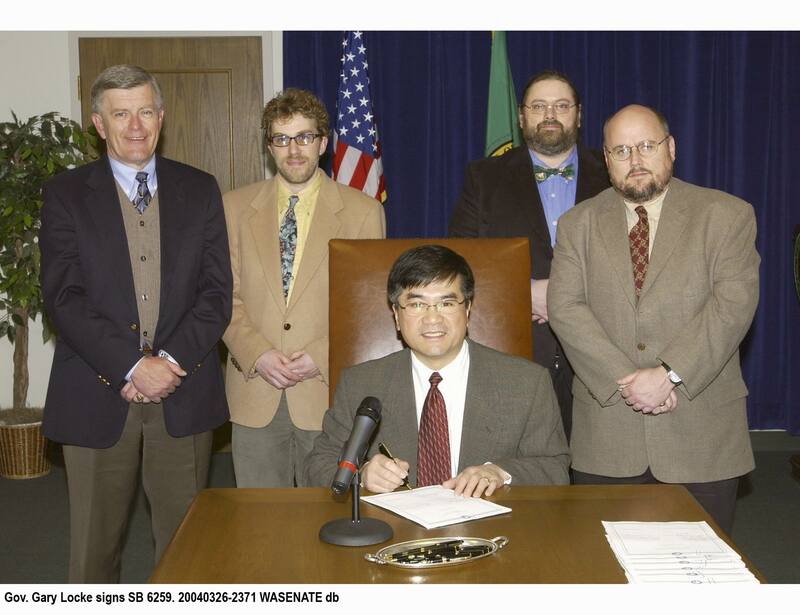 He also serves as chairman of the board of the Washington State Internet Lobby. Stewart would also like to formalize his college degree by getting his credits transferred to one institution, so that he may graduate and continue graduate studies in management and the global economy. He admits that he can’t point to any one person in his life who he tries to emulate or from whom he learned his business skills. “I guess I feel my generation didn’t have a lot of heroes’ to emulate,” he explains. “We had to find inspiration on our own.